Yesterday was the launch of the Lord of the Rings Online Legendary server, and it was quite an event for a game that otherwise has felt a little tired to me of late. Yesterday I posted a list of potential events that might happen with this launch. I was right on a few, but off base with even more, including my first one. The server was pretty much up on time. Somebody tell Daybreak about that. 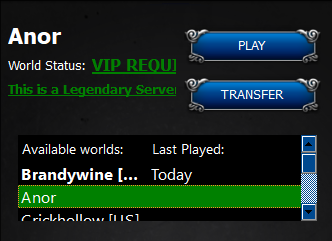 I was working from home yesterday due to being on call for jury duty… again… so was able to kick off the launcher to see if the server was up on time. And sure enough, it was there. It was a good thing I patched earlier in the week. I heard that patching was going really slow at times. But at least it did not die. And within five minutes it had gone from red to green. People could log in. I figured I would log in, create a character, then log out and come back later. The server had other ideas however. While I missed the mark on the server being late, I was spot on in there being a queue. Being in the queue I put that in the background and went back to work. I checked back in about an hour and found my position hadn’t changed. Thinking something was wrong, I closed the launcher and opened it up again, only to find my position in the queue had doubled with this maneuver. I was at spot 3,335. It was going to be a long wait. So I put it in the background and continued on with my day. Four hours later, as my work day was coming to a close, I found myself still in the same spot in the queue. Meanwhile, the LOTRO team had put out an update. They knew about the queue problem and that the overwhelming response was going to get them to put up a second server the next day, so we would have Anor and Ithil, sun and moon, with free transfers available between the two for a limited time. A later follow up pulled the Ithil server launch in to 23:00 UTC yesterday. I am not sure if there had been calls for a second server in the forums, but I was surprised they were ready to go on this. Yay for planning. The second server was online early even. The update also said that they had fixed the queue problem, but I am not sure that the concept of a queue was really clear to them. It still seemed completely broken by the time I was done with work and ready to play. 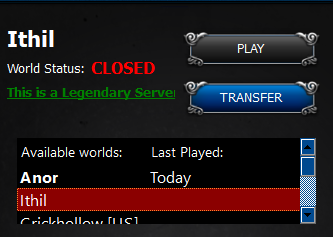 Logging out and back in put me as high as 4,800 in the queue. However, adding up tidbits from the forums and some advice from Roger of Contains Moderate Peril, who was in and playing already, I was able to come up with my own queue beating method. I opened up two launchers. I logged in and got in the queue with the first launcher. Then I logged in and got in the queue with the second. If the queue number was the same or higher, I used the “logout” option from the menu and logged in again. If the number was lower, I swapped to the first launcher, logged out, and logged back in until I got a lower number. This seems insane, or at least just dumb. Yet, somehow, this worked. As I ping ponged back and forth between the two launchers the numbers kept going down. It was slow at first, but I would say after about ten minutes the numbers started to drop. When I hit triple digits I was very happy, and double digits were not that far off. And then, finally, the launcher logged me in! Then I had to figure out what I wanted to play. I hadn’t actually thought much on that. But, when in doubt, I tend to have a class that I feel is the default in most games. In this case I went with a man champion, which is the most ret pally class in LOTRO I think. Plus I know those skill icons so well! I didn’t even fiddle with his appearance, I just wanted to jump into the game and play, so I was quickly in the tutorial. This was when the weight of years began to tell. The first thing you do is get a weapon out of a pack on the floor, though in my case it was worse than the default weapon I started with. But in getting it out of my bags, I realized that they were already full of stuff. What is all of this stuff? There is the ring from the pre-order and the Glass of Aglaral from the special edition along with anniversary gifts, years 1 through 11 inclusive, plus bonus items from various expansion pre-orders and specials. 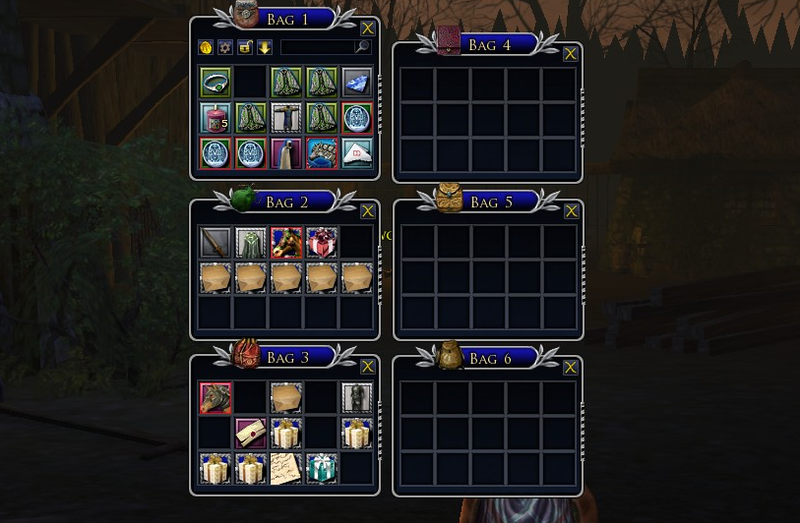 One of the nice things about LOTRO is you get bags right away. The downside is that is all you get for inventory space. And with over a third of my bag space taken up, I was feeling the need to get to a bank. But first I had to do the intro. That went smoothly enough, and I exited into what I thought was Bree. I thought that because it was so full of people. But no, I was not yet at Bree. This was Archet, the starting area outside of Bree. It was full up, and had multiple instances of itself running. Dynamic layers for all my friends! Like so much else, I had forgotten about dynamic layers, the phasing/sharding technique that Turbine put into the game at some point after launch. I suppose I just haven’t been in a zone that needed it for a long time. So that spread people out some, but the starting zone was still pretty packed. I was glad to see that somewhere along the way they also changed how mob credit worked. Everybody who tags a mob now gets credit for the kill, which was helpful because the local fauna was being hunted to extinction. Archet hasn’t changed much, but it has been years since I was there, so it was a series of “Oh yeah, this quest!” moments as I ran through. 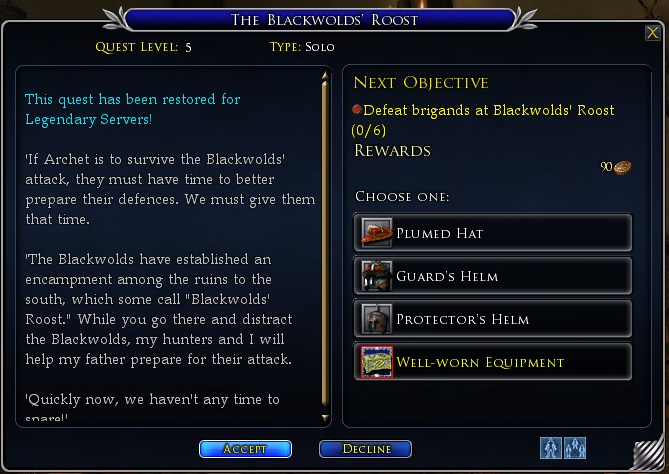 I was interested to see that they had even restored a few quests specifically for the server. The above example actually gave out duplicate rewards when compared to the quest that replaced it. (The objectives were pretty close as well.) But that suited me. I got the Protector’s Helm for the stats and the Plumed Hat for the style. I had also forgotten how pretty the world is. I know I mention that from time to time, but it had still been diminished in my memory, so seeing the flora and the reflections in the water and all that was still surprising. My current rig lets me have all the graphics cranked up. Character models are still what they are though, even after the improvements. If there was any more clipping they’d have to call it a barber shop. I carried on got that “specialization needed” alert, meaning it was time to pick my class traits. I went with the martial champion option this time on the theory that DPS would still be good but being able to tank at some point might be helpful. I still moan about these skill trees. I also unlocked my riding skill, and had a selection of mounts in my bag ready to choose from. I saw a lot of people riding, though I was surprised it wasn’t more. After Archet I headed to Combe to continue on down the quest chain, though not before riding off to Bree and the bank to empty out as much of my inventory as possible. 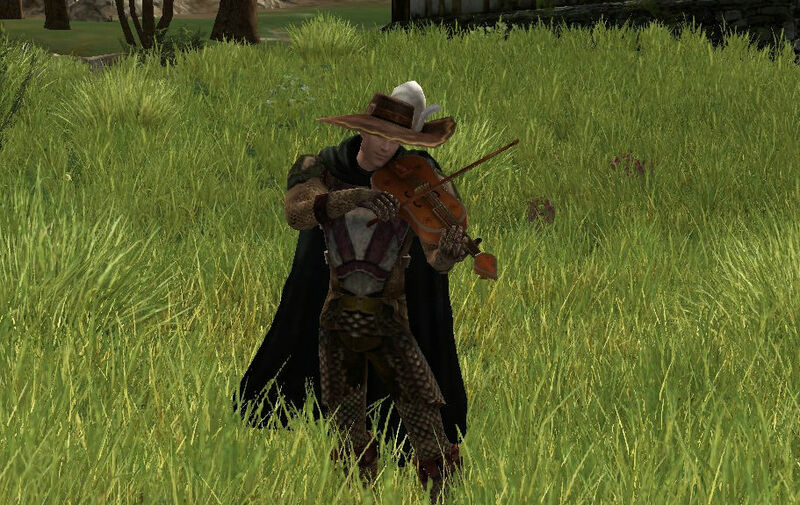 Back in Combe I also stopped for a bit to remember how to play music in LOTRO, one of the all time great features of the game. I bought some instruments. I played Istanbul (Not Constantinople) on my lute and got some applause. I also fiddled around with a fiddle, a new instrument since I last played. It is very good for classical music. Then it was back to the quest chain. There were occasional problems with mobs being cleared. No wolves in the wolf den, no Blackwolds and Bauman’s farm, no bears to find a stolen pack from. But most of the time it wasn’t an issue. And there are a number of quests where the constant traffic thinned out an otherwise grindy level of mob clearing one might otherwise have to do in order to reach a quest objective. The main pain was harvesting. I, of course, had to pick a crafting profession. I went with weaponsmith, which means mining ore. But ore nodes were heavily contested as people ran or rode to them as soon as they popped. I won’t be making many bronze weapons in the near future. I finished up my evening closing in on level 11. I am not sure if my champion is really going to be my main. I’ve done that class more than a few times, so I might try something else. But it was good fun to be in the early game again. It is fun and brings back lots of good memories, so I feel good playing. And we’ll see what the queue is like tonight. 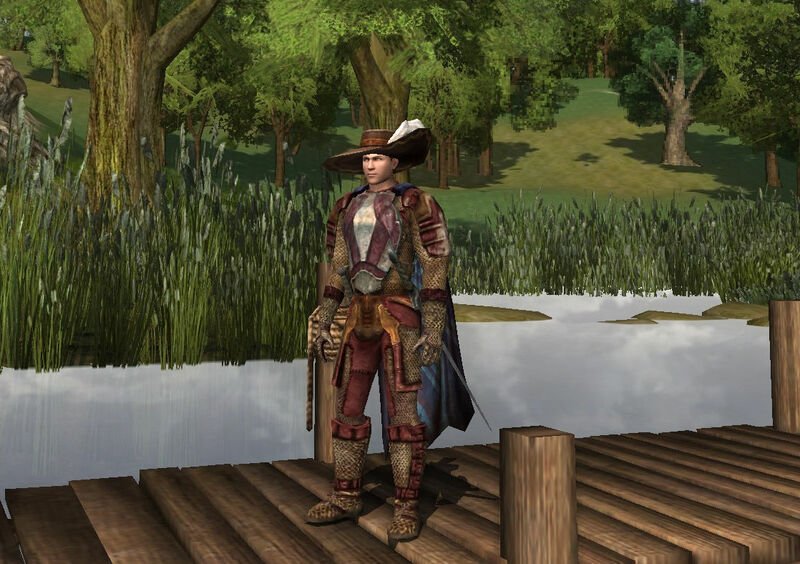 This entry was posted in entertainment, Lord of the Rings Online and tagged Anor, Ithil, LOTRO Legendary on November 9, 2018 by Wilhelm Arcturus. @Alunaria – I already have some mild anxiety about server queues and the longstanding WoW tradition of never being on the same server as half the people you know who are playing. Still, if WoW Classic ends up even half as popular as it threatens to be it ought to be quite a ride. 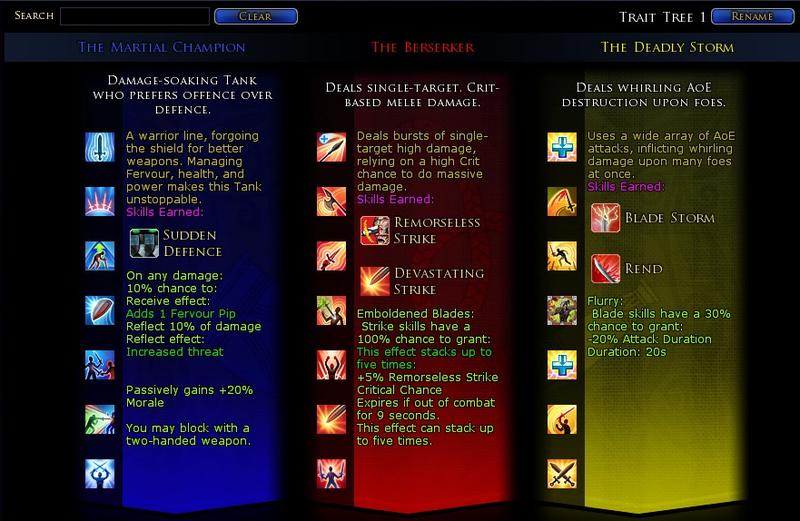 EverQuest II - News - Hunt for Bonuses and Deals on Beast'r Weekend! EverQuest II - News - The Beast'r Hunt is On! EverQuest II - News - Desert of Flames Has Unlocked on Nagafen! EverQuest II - News - It's No Joke - Bristlebane Day Has Returned!